We have been working hard in 2013 to enhance our products. All our mail converters (outlook, thunderbird, mail) have been improved greatly since they are in demand and we got tremendous feedback from our customers. We have also released some new products like Total OST to PST Converter, Coolutils Photo Viewer (streamlines transferring photos from your camera with handy sorting and renaming options), Mail and Outlook viewers. All of these are included into the bundle now. Find the list of new options in the programs below. 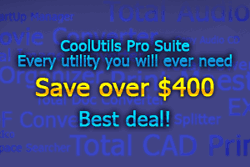 Good news: if you purchase CoolUtils Pro bundle upgrade now, you will get all the major upgrades of our programs released in 2014. All your new keys are valid till January 2015! Email us at [email protected] with any questions or concerns. New - The new version supports OPUS and VOX audio files. OPUS boasts of better sound quality than mp3 with the same file size. New - view MSG and EML files outside any email client! New- now converts emails from www.Outlook.com. New - support CSV files that are over 1 GB in size. -Options file feature has been improved. New - a new command line parameter to turn off Fit-to-page option. New - now supports even corrupted XML files (i.e. without the root). Transfer photos from your camera to the pc in no time. New - now supports PowerPoint attachments. - is able to convert Outlook emails and embedded images.